The article reproduced below bears no author’s name. However it is widely asserted in Hook to have been the work of Fred Mancey and to have been written about 1960. Fred was born in the village and spent most of his life in Hook. He worked on the railway. He was transferred to Devon for a few years, but returned to the village and spent his final years living with his daughter in Raven Road. He died in the late 1980s. The article is reproduced exactly from the original, but I have annotated it to give references to present day landmarks, people etc. Footnotes: Hold the cursor over a footnote marker to see the text. Footnotes are also listed at the bottom of the page. It is proposed to take you only on a stretch from Murrell Green to the Dorchester Arms, and to see whom we shall meet on the way. From that establishment we cross the road (now the A.30) to an old posting house known at one time as the Kings Head. This house, in the early years of the last century was kept by John Webb, who also farmed some 100 acres. He was a member of a well-to-do family who must have been resident in the locality for many years, this being borne out by the numerous tombstones erected in their memory at the S.W. angle of Newnham Church. To give us moderns some idea of what a posting house was like we must have recourse to the Badminton Library “Driving” by the Duke of Beaufort, who wrote as follows: the great Post House proprietors, all keepers of hotels and inns used to have in their stables thirty or forty pairs of horses, and a postboy and “cad” to each four horses, the whole superintended by an experienced ostler, these proprietors would not keep a postboy who did not drive well. The ‘boys’ were brought up to it from childhood: a strong, small, hardy race of men, about the size of the modern flat race jockey. On arrival at an Hotel of a Post chaise, if there were ladies in the carriage, the Landlady, a very grand person with a charming voice and manner, dressed in a rich stiff white collar, stiff high white hat, and black silk gown, would step forward and say ‘Will you please to alight’. Stepping down from the carriage they would be attended by neatly dressed hand maidens, who with demure grace, would hand to each a glass of most excellent cherry brandy. At this time the Turnpike Trust was in charge of this Road, and a Toll Bar covering the West Green Road was placed at the end of the garden , and tolls were collected here even as late as the 1870’s. The road from here to the River Whitewater was known as the Toll Bar, very tall elm trees being on both sides of the road, meeting overhead, making it a dark and frightening avenue for anyone who had to walk it by night. On the left is a roadway leading down to the common known as Holt Lane. On the corner stood a row of cottages and every winter when the rains came, the lane flooded, the water flowed in one door of the cottages and out of the other. Turning a short way down the lane to the right we come to the Mill House. It has been said that it was originally a paper mill. Be that as it may it appears to be contemporary with the Billet. In the 1870 it was run by Joseph Steer, and flour was made there into the beginning of this century. Mills all over the country are now derelict, and on its course from Bidden (4) to Hook about five mills were operating even on this small stream (5). Passing up the road we reach Searles Lane from whence the local ghost was said to appear. He was referred to as “Old Winnaker”, anyone who saw him knew it was the sign of that person’s early death. (Full details can be found in “Phantom Footsteps” by Alastair McGregor). Forward the road was straightened many years ago for it formerly curved and passed immediately in front of Hook House, for many years the home of a firm of solicitors by the name of Bird. We now arrive at the “Raven” (6) a well known public house kept in 1830 by James Hewett. On land adjoining this hostelry a yearly fair was held, where swinging boats were a novelty, and there was much merry-making right up to the beginning of this century. Here we have a fine example of a house built in the parliament days of 1653. The brick herring bone noggin is a special feature to be noted. At this house Jack the Painter, alias James Aitken, the man who set fire to Portsmouth Dockyard on 7th December 1776, was taken prisoner. Again on the left was Harletts Park (7), where the late Col. F. G. Barker, a very keen sportsman, encouraged the local lads to play cricket and football. Football in those days was a joy to behold, even though the players appeared in long trousers and hob nailed boots. The names of Lovegrove, Mancey, and Maynard were acclaimed the heroes of the sporting world of the Village. Again on the left we reach an old wheelwrights shop (8), in which a well known inhabitant for many years, Mr. Budd, plied his trade. He was succeeded by his son-in-law, and the business carried on by his grandsons, the Beeston Brothers, well into this century. Farther on the Reading Road joins the main road, and it is this where the scythelike bend occurs, referred to earlier. 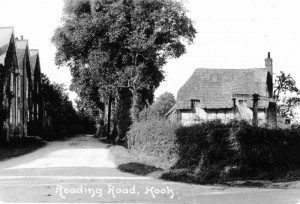 Just behind where the Apex garage now stands (9), stood a quaint thatched cottage, being the home of George Goodger and his wife. George was the earliest apprentice of A. W. Gower, and spent some 60 years in his employ. His wife had been one of the maids at the “Kings Head”. For years the Goodgers kept a cow or two on the common. It is said that should one of the cows fall ill Mrs. Goodger would sit up all night to nurse it, but if George was not well she would say “I gi’ed he a dose of hartshorn & he’ll get over it”. The cottage was a great favourite with artists until demolished. The last family to live in it were the Slades. Next door stood the Village shop kept by Mr. Varndell (14). About 1850 his son John took over the business, and many funny stories are told about this gentleman. One is worth telling. One day John decided to sweep the chimney in the correct manner of the day – by climbing up inside it. When he was about half way up a customer came into the shop, so down John had to come to serve a very startled person. A grand-daughter is still in the Village. The road passed behind where the shops now stand, and now we come to an academy of some importance which stood on the edge of the common. It was known as “Rose Cottage” (now the “Grange”) and was owned by Ann Webber. It passed to her nephew, John Webb of Murrell Green, who died at the early age of 45. After his death his widow came to Rose Cottage with her sister, Mrs. Parsons, and started a school for young ladies, and this was run very successfully for over 40 years. These ladies lived to be over ninety. At their death, the house, and the foundry next door were bought by the Gower family. Across the way is the Foundry (17) which for well over a century has played an important part in the everyday working life of the Village. In the early part of the last century, a Suffolk man named James Smyth invented a new kind of corn drill, and he sent agents with the drill into most of the Southern counties to use it at so much an acre, and also to teach the natives the art of drilling. James Smyth had himself been in the habit of coming into this district, staying at the “King’s Head” and was friendly with the host, John Webb. In the year 1819 he was awarded a prize of a silver cup for his invention. He had commenced business in a small way in 1800, and by 1825 was making headway. When calling on his friend John Webb he mentioned that he was looking for a site to enable him to give his son-in-law, Andrew Woodgate Gower, a start in business on his own. 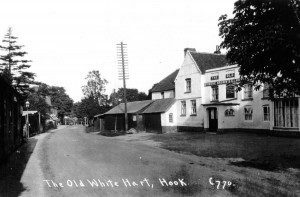 John Webb stated that his Aunt had the Road Wagon Station opposite the “Old White Hart” vacant, and suggested that they should ride over to “Rose Cottage” to see her. This was done, and she agreed to build a house (18) and some workshops on the site, and these were occupied in 1826. Work started in making ploughs, but it meant a lot of hard work to build up a business, for to meet the farmers and make a sale meant walking to Reading for the nearest market place. Considerable opposition was met with from farm labourers at the introduction of machinery, and gangs were organised to smash it up as soon as made. Men from Upton Grey, Bramley, and Hartford Bridge, and other places, met and planned the destruction of these machines which were to deprive them of their work, but bit by bit resistance was worn down, and mowing machines and reapers were added to the business. Plough shares were made at the foundry, the last moulder being “Jimmy” Waldren, who taught many of the present generation in his Sunday School. In 1851 the premises were burnt to the ground. The accepted “Squire” of the village at this time was a rare character who loved his whisky, and after visits to the “Spread Eagle” could be heard, on his way home, declaring at the top of his voice that he was William Goring, Yeoman of Sheldons. A famous landmark in the shape of a fine tree stood in front of the one storied thatched cottage (19) just up the road. It was a Scotch fir, the top shaped like an umbrella, and could be seen for miles around, and was much admired. It was taken down about 100 years ago, much to the regret of the inhabitants. On the opposite side of the road might be seen a building in the form of a small granary, supported on posts about seven feet in height. This was the workshop of a man named Ford. In this building he compounded a lure and poison for destroying rats. It was made of a secret formula, the secret only being handed down to the next of kin when death came along. Ford’s customers were the local farmers, who engaged him to kill the rats on the farms at five shillings a time. He owned a peculiar form of cart in the shape of a box on wheels, with ladders fastened on the sides, the whole being drawn by a piebald pony. With several sacks of rats’ tails on board, he visited the markets at Reading, Winchester, Salisbury, and other places, and with the evidence of his ability to destroy vermin, he did a roaring trade. He later became the owner of a steam engine and some thrashing tackle, and let it out on hire. He was the first man in Hampshire to do this, and he carried on this business until his death. The road from here veered to the right (now the Newnham road), and a little way along here we find another Toll Bar, outside the Post Office. (20) Further along it turned to the left across to the “White House” or “Dorchester Arms”. (21) Here gathered most of the working men held their various meetings and had their arguments. The first competition for the transport trade brought much custom to the house. About 200 years ago Inland Navigation came to the fore and about this time the Basingstoke Canal was made. The men selected for this work were of physical toughness and strength and these “Navigators” or “Navvies” retain the name to this day. At the “White House” they met, fought, wagered, held sporting events, and made merry after their hard day’s work on the Barge River. The next competitor was the Railway. Rumours of the iron road reached the customers of the Inn in the early ‘thirties, and the pro’s and con’s threshed out, the worker on the canal backing his barge, and the coachman his horses and coach for ever. A few years later another army of navvies arrive and the great cutting in front of the house was completed and Puffing Billy commenced his reign. We have travelled this famous highway along which has passed Kings, Queens, Statesmen, Soldiers, Sailors, Highwaymen and robbers. About a mile from this point in our journey across Bartley Heath, in the next parish, are the remains of a castle. Here, that restless monarch, King John, is reported to have stayed some 19 times, and three days before signing the Magna Carta in June 1215 he was residing there, from whence he and his cavalcade passed over the trackway on the Common to Holt, thence onto the main road, and so following the river on to Windsor. 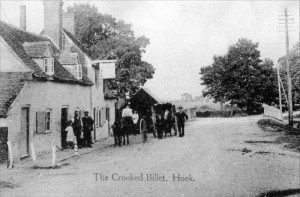 A feud which lasted long into the this century was in existence between Hook and North Warnborough, and any Hook lad who cast his eyes on a lass in the other parish, was sure to meet with strong opposition, and even had to fight his way so that he might go a’courting. I close with a poem written by John Gay, the author of the “Beggars Opera”. It being an account of his journey to Exeter in the eighteenth century which I hope will be of interest. For still on Sundays, country horses rest. Through Hammersmith, jog on to Turnham Green. But feeds no more, for Solomon is dead. For dirty streets and white-legged chickens known. We come, where Thames divides the meads of Staines. Shook her frail bridge, and tore her piles of wood. Where broken gamesters oft repair their loss. While the fat landlord welcom’d every guest. How many bottles drank, and what their cheer. And praised their wisdom much, their drinking more. The morning sun rose, but we lay fast asleep. And Popham Lane was scarce in sight by one. Twas here the stage coach lass resigned her gold. And sent her home, a Belle, to country towns.